There’s a chill in the air, which can only mean one thing — fall is coming. Fall is a great time to spend a little extra time and care on your dog’s grooming regimen, while tailoring their grooming to the unpredictable weather and cooler temperatures. 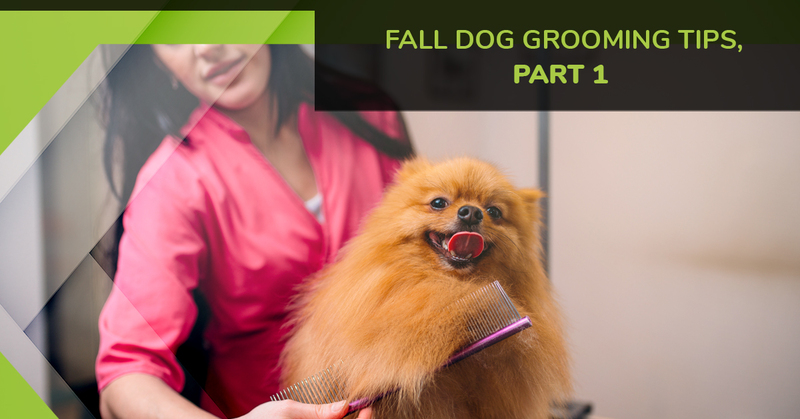 Today, the friendly groomers at The Dog Pawlour will share with you a few dog grooming tips to consider this fall. Is your dog ready for a grooming? Book an appointment with our friendly, highly-certified groomers at The Dog Pawlour. We offer Top Rated Local® dog grooming in Greeley, as well as self-service dog wash stations if you prefer to groom your pup yourself. Dogs, like their human countertops, change their seasonal wardrobe, so to speak. Dogs go through seasonal cycles of shedding so their coat isn’t too think for summer and too thin for winter. Dog shed their thinner summer coats to make room for a heavy, warmer coat to protect them during the colder months. It’s important to brush them regularly while keeping their new coat clean. Our furry friends can suffer from similar fall allergies that affect us humans, causing dry skin, itchy, watery eyes, and frequent sneezing. If you notice your dog scratching a lot more, it may be that their skin is dry and itchy due to the changing temperatures. Excessive scratching can cause sores and welts to develop, so keeping their skin and coat conditioned can help combat this allergic response. Talk to your local groomers about deep conditioning treatments for your dog. Fleas and ticks are two of the biggest concerns for pet parents, and these pests remain active well into the fall here in Northern Colorado. In fact, adult ticks are highly active in the fall. Be sure to thoroughly check your dog for ticks after spending time outdoors. Additionally, keep up with your flea and tick prevention routine to safeguard your dog from these pests during fall. Is your dog ready for a trip to the groomers? Book an appointment with The Dog Pawlour for Top Rated Local® dog grooming in Greeley! If you’d rather groom your pup yourself, don’t spend time searching “self-service dog wash near me” when we offer spacious, ergonomic self-dog wash stations for a comfortable DIY grooming experience. Join us next time to learn more fall grooming tips for dogs! In need of doggy daycare for your precious pup? We offer compassionate daycare services for dogs in both our Fort Collins and Greeley locations. Follow the link to learn more about doggy daycare!